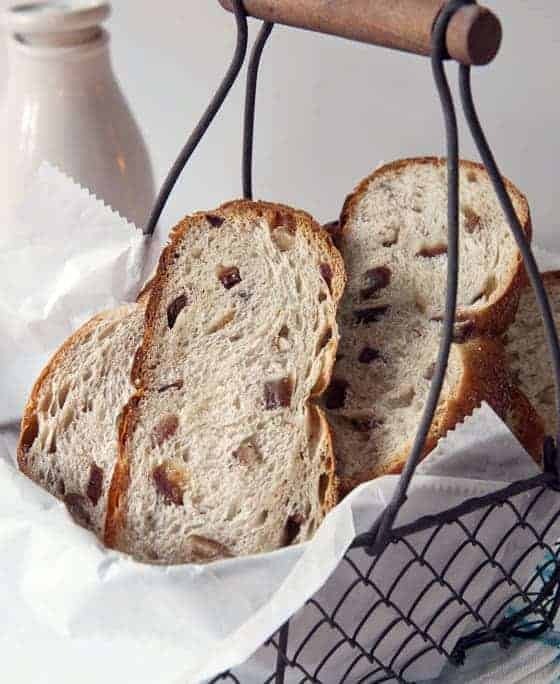 Banana Pecan Yeast Braid is a slightly sweet banana yeast bread packed with dates and pecans, mixed in a bread machine, shaped by hand, then baked in a conventional oven. You can also make it by hand or with a stand mixer. See directions in the notes of the recipe below. Aging bananas can be hazardous to your health! You might know what I mean if you can’t stand to see bananas go to waste but don’t like to peel and eat them when they become spotted and soft. Although they freeze well for making nutritious smoothies, a lot of my old bananas used to end up in delicious but rich and caloric banana bread–the quick type that’s more like cake. When traditional banana bread is sitting around my kitchen, it’s easy to rationalize eating one slice, then another, and then half a slice and then the cut end needs to be cleaned up so I eat the irregular crumbs. My solution? Make banana bread with yeast instead. It’s a little bit sweet but not overly much. Pack it full of dried fruits or not. Add nuts or not. Use part whole wheat flour if you like. (See recipe here.) Either way, you won’t need nearly as much sugar or fat to make banana bread this way. 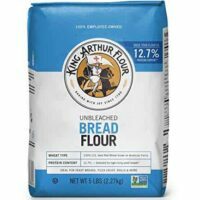 This recipe is written for the bread machine (used for mixing and kneading only) but you could use a stand mixer or do it all by hand if you prefer. Add all ingredients but dates and pecans to bread pan in order given. Select dough cycle. Add dates and pecans when machine beeps that it is OK to add extras. OR, do what I do and knead dates and pecans into dough after you remove it from the bread machine and before you divide it into 3 pieces as described below. When dough cycle is complete and dough has risen to double inside bread machine, remove dough to floured surface or silicone baking mat (my favorite). Divide into three equal pieces and roll each into a 15-inch rope. Braid ropes, pinching ends together and then tucking under at each end. Place braid on silicone mat or parchment paper. Cover with tea towel and let rest in warm spot until nearly doubled in size-about 1 hour. Combine sugar and cardamom in small bowl for topping. Brush twist lightly with milk and sprinkle sugar mixture evenly over bread. Bake at 375 F for 25-30 minutes or until 190 degrees internal temperature. Allow to cool if you can wait that long. P.S. If the whole idea of braiding bread dough intimidates you, click here for an illustrated tutorial. Thank you Paula and everyone else, for a fantastic recipe. 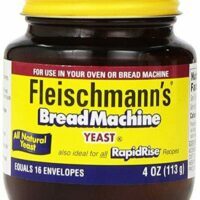 It’s delicious, such a comforting homemade yeast bread smell while it cooks and and the taste! Its just perfect, crusty crust and tender sweet bread. We made it in our breadmaker – so easy, but maybe next time I’ll braid it. I used milliander’s idea of the frozen bananas, microwaved them and then mixed with the cold milk so both were warm when added to the flour mixture. I switched raisens and walnuts for the dates n pecans, just what I had on hand. Oh Lisa, So glad to hear you enjoyed the banana bread. I can’t make it often–have no willpower when it is in the house. Raisins and walnuts sound wonderful! another idea!! I freeze the whole banana, take it out and it thaws very fast. Cut off the end and hold it by the stem and it drains into a measuring cup. No mess or cutting up. It is all measured without touching the inside at all. When do you add the dates and pecans? Add them when your machine beeps that it is OK to add extras, usually close to the end of the kneading cycle. OR…you can knead them into the dough by hand after you remove it from the bread machine. That’s what I do because I always seem to miss the beeps. I revised the recipe. Thanks so much for asking. I also like the way you store frozen bananas. Very handy! Just a note on the comments above about wishing it used more banana…that’s why I used 1 cup instead of 1/2, to use up some more of the fruit. 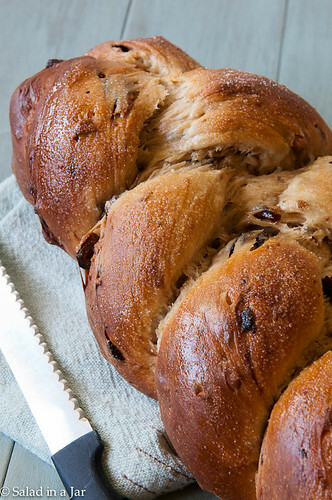 The bread has a very banana-y flavor this way – you just have to adjust the other liquids. I wanted to keep the egg in so I just dropped the water & milk. 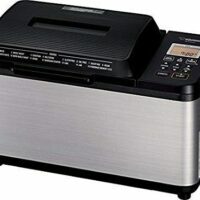 Many bread machine recipes add in dry milk rather than fresh, so I went that way, and it worked very well. So it depends on how many bananas you want to use up (guilty!) and how much banana flavor (1 cup = a TON of banana flavor). Oh MY GOODNESS, this is awesome bread! I think it even trump my cinnamon raisin. Slightly sweet, very fruity (see below tweak) and just delicious. Good morning all! I’m new to your blog and I must say i am so glad I found you! This bread sounds wonderful. Just a curious question though, can this be made in a machine (sans braiding of course). I’ve always made my bread the old fashion way and just got a machine so im on this kick of using it for pretty much everything. I’m making this bread the braided way today. I was just wondering. Thanks again! Love the blog! Are you asking if the bread can be baked in the machine? If so, yes. I never do because I don’t like the shape or the crust one gets from a bread machine but the original recipe called for doing the whole thing in a machine. Enjoy! I love this idea and can’t wait to try it. Overripe bananas are one of my favorite things to bake with! I love banana bread and make it often. Never have I thought to make a yeast banana bread. I just may have to give this recipe a whirl. I’m so glad I stopped by your blog again today. 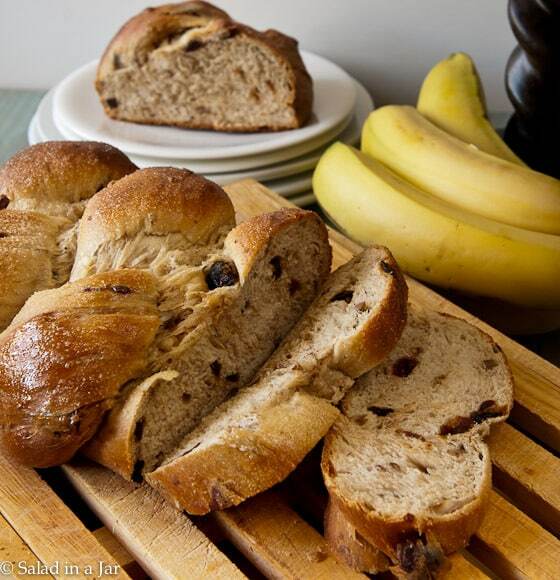 I have some bananas that need to be used and this bread looks like it would be really delicious for breakfast with some of the yoghurt I made from your directions – maybe with a few fresh raspberries from the garden. Another delicious bread recipe from dear Paula! I wish it used more than 1/2 cup banana because I always have more bananas that need using up 🙂 Guess I will have to make a couple loaves of bread and share them! Well, yes, you are right about the 1/2 cup of banana. But this stuff makes wonderful little cinnamon melba toasts which we eat like cookies so it’s not a problem to have two loaves around. What a genius way to use up those gnarly bananas! I fear the yeast, but this looks so good!